Objective With data on frequency of hearing loss in Russia and Eastern Europe generally lacking, we assessed the prevalence of hearing loss in a Russian population. Setting The population-based Ural Eye and Medical Study was conducted in the rural and urban regions of Bashkortostan, Russia. Participants With an inclusion criterion of age 40+ years, the study included 5899 (80.5%) out of 7328 eligible individuals (mean age: 59.0±10.7 years; range: 40–94 years). Primary and secondary outcome measures Hearing loss was examined in 5397 (91.5%) study participants, assessed using a standardised interview with questions from the ‘Hearing Handicap Inventory for the Elderly Screening Version (HHIE-S)’. Results The prevalence of self-reported hearing loss (26.1%, 95% CI 24.2 to 27.2) increased from 10.9% (95% CI 8.0 to 13.7) in participants aged 40–45 years old to 59.0% (95% CI 51.6 to 66.4) in those aged 80+ years old. It was higher for men than for women in the 60–80 years age group (38.93%, 95% CI 35.8 to 42.1, vs 32.8%, 95% CI 30.2 to 35.3; p=0.003). On multivariable analysis, higher prevalence of hearing loss was associated with older age (p<0.001; OR [per year of age]: 1.06 [1.06 to 1.07]), male gender (p<0.001; OR: 1.26 [1.09 to 1.47]), higher depression score (p<0.001; OR: 1.06 [1.04 to 1.08]), higher prevalence of headache (p=0.001; OR: 1.27 [1.10 to 1.47]), history of cardiovascular diseases including stroke (p=0.001; OR: 1.32 [1.13 to 1.55]), and osteoarthritis (p<0.001; OR: 1.40 [1.18 to 1.67]), physically vigorous activity during work (p<0.001; OR: 1.40 [1.21 to 1.62]), alcohol consumption (p<0.001; OR: 1.51 [1.28 to 1.78]), and dry eye feeling (p<0.001; OR: 1.67 [1.30 to 2.16]). It was marginally correlated with a higher anxiety score (p=0.07; OR: 1.03 [0.998 to 1.06]). It was independent of diabetes (p=0.52), arterial hypertension (p=0.20), level of education (p=0.11), region of habitation (p=0.70), blood concentration of high-density lipoproteins (p=0.17) and low-density lipoproteins (p=0.52), current smoking (p=0.95) and smoking pack-years (p=0.37), and best corrected visual acuity (p=0.93). Conclusions As in other countries the prevalence of hearing loss is high in this elderly population in Russia. It is primarily or secondarily associated with older age, depression, male gender, cardiovascular disease and alcohol consumption. The assessment of hearing loss in an interview containing a series of 11 standardised questions without performing an audiometric examination was a limitation of the study. Although noise is a major determinant of hearing loss along with ageing, exposure to noise at the workplace was not directly and specifically assessed in the study. Performing the study in Russia, where no population-based data on hearing loss have been available so far, was a strength of the investigation. The study sample size of 5899 participants and the participation rate of 80.5% were strengths of the study. The relatively high number of parameters examined in addition to hearing loss and enabling a wide search for associations between hearing loss and other parameters were strengths of the investigation. Despite its importance for public health, the prevalence of hearing loss and its associated factors has not been widely investigated worldwide.2–11 For many countries, data on the prevalence of hearing loss are not yet available, and the factors associated with hearing loss have not been examined in a detailed manner. This holds true in particular for Russia and Eastern Europe. We therefore conducted this study to assess the prevalence of hearing loss in a Russian population and to explore the associations of hearing loss with other parameters such as gender, region of habitation and level of education. The Ural Eye and Medical Study (UEMS) is a population-based investigation performed in the Russian Republic of Bashkortostan, in its capital Ufa (Kirovskii region) and in a rural region consisting of villages in the Karmaskalinsky District. The latter was located at a distance of 65 km from Ufa.12–14 The inclusion criteria were living in the study regions and age 40+ years. Assuming a participation rate of approximately 80% and aiming at a study population size of about 5500–6000 participants, the number of eligible individuals was calculated to be approximately 7000–7500. The number of study participants (ie, 5500–6000) was based on experience gained from previous population-based investigations, the study populations of which were assumed to have similar prevalence of major diseases as the present study population. As recently described in detail, the series of examination further consisted of measurements of arterial blood pressure, pulse rate and body height and weight, handgrip strength (as measured by dynamometry), blood concentrations of glucose, blood lipids and other substances, and pulmonary function (spirometry).12 13 Arterial hypertension was defined by a systolic blood pressure ≥140 mm Hg and/or diastolic blood pressure ≥90 mm Hg, and/or self-reported history or current treatment of arterial hypertension with antihypertensive medication. Diabetes mellitus was defined by a blood glucose concentration ≥7.0 mmol/L, or a self-reported history of physician diagnosis or of therapy for diabetes mellitus. Hearing loss was assessed by a series of 11 standardised questions, 10 of which were derived from the ‘Hearing Handicap Inventory for the Elderly Screening Version (HHIE-S)’ (box 1).17–19 The questions could be answered by ‘no’ (0 point), ‘sometimes’ (2 points) and ‘yes’ (4 points). The total hearing loss score was the sum of all points and could range between 0 and 44 points. The amount of hearing loss was assessed by the hearing loss score. The HHIE-S had been applied in previous investigations.17–19 The diagnostic performance of the HHIE-S against five definitions of hearing loss as assessed by pure-tone audiometry had been investigated in a previous study on 178 elderly subjects.20 The HHIE-S had sensitivities ranging from 53% to 72% and specificities ranging from 70% to 84% in the different definitions. The receiver operating characteristics and the likelihood ratios of the HHIE-S were similar regardless of the hearing loss definitions. Another investigation had examined the reliability, validity and associations of the HHIE-S with quality of life measures, such as subjective well-being, depressive symptoms, subjective loneliness and physical functioning.21 The investigation revealed that the reliability of the HHIE-S was relatively high, with a Cronbach’s alpha coefficient of 0.91, a Spearman-Brown coefficient of 0.90 and an intraclass correlation coefficient of 0.85. The prevalence of self-reported hearing loss as a binary variable was assessed using a single question: ‘Do you experience a hearing loss?’ We additionally carried out Weber’s test and Rinne’s test. Do you experience a hearing loss? Does a hearing problem make you feel embarrassed when meeting new people? Does a hearing problem make you feel frustrated when talking to members of your family? Do you have difficulties hearing when someone speaks in a whisper? Does a hearing problem cause you difficulties when visiting friends, relatives or neighbours? Does a hearing problem make you attending religious services less often than you would like? Does a hearing problem make you having arguments with family members? Does a hearing problem cause you difficulties when listening to television or radio? Do you feel that any difficulty with your hearing limits or does it hamper your personal or social life? Does a hearing problem cause you difficulty when you are in a restaurant together with relatives or friends? Using a statistical software program (Statistical Package for Social Science, SPSS V.25.0), we first calculated the prevalence of hearing loss and then assessed its associations with other parameters on univariate analysis. Finally, we performed a multivariable regression analysis with the hearing loss score as the dependent variable. The list of independent variables included all those variables which were associated (p≤0.10) with the hearing loss score on univariate analysis. Multicollinearity was also tested. The prevalence of hearing loss was analysed in a binary regression analysis. We assessed the ORs and their 95% CIs, and the level of statistical significance was set as p<0.05. Subjects with data on hearing loss as compared with individuals without hearing loss data had a significantly younger age (p<0.001) and were significantly more often men (p<0.001). The mean hearing loss score was 5.13±10.95 (median: 0; range: 0–44). Within the group of ethnic Russians (n=1185; age: 60.1±11.1 years), the mean hearing loss score was 5.58±11.09 (median: 0; range: 0–44), with no significant (p=0.11) difference from the non-Russian group. An abnormal result of Weber’s test was found in 210 (3.9%, 95% CI 3.4 to 4.4) study participants and an abnormal result for Rinne’s test in 3390 (63.0%, 95% CI 61.7 to 64.3) individuals. The hearing loss score differed significantly between individuals with a positive Weber’s test and those with a negative Weber’s test (23.9±14.7 vs 4.4±10.1; p<0.001). On univariate analysis, a higher hearing loss score was correlated with parameters such as older age (p<0.001) (table 1, figure 1), male gender (p<0.001) (figure 1) and other variables (online supplementary table 1). The multivariable regression analysis included the hearing loss score as the dependent variable, and as independent variables all those parameters which were associated (p≤0.10) with the hearing loss score on univariate analysis. Due to collinearity, we first dropped the parameters body weight (variance inflation factor [VIF]: 6.8) and waist circumference (VIF: 4.0). We then dropped step by step parameters such as prevalence of arterial hypertension which were no longer statistically significantly associated with hearing loss on multivariate analysis. In the resulting final model, a higher hearing loss score was associated (regression coefficient r: 0.33) with older age (p<0.001), male gender (p<0.001), higher depression score (p<0.001), higher prevalence of headache (p<0.001), history of cancer (p=0.008), cardiovascular diseases including stroke (p=0.003), and osteoarthritis (p=0.006) and skin disease (p=0.01), lower number of days with intake of fruits (p=0.02), and higher amount of physically vigorous activity during work (p=0.008) and of physically moderate activity during leisure time (p<0.001) (table 2). 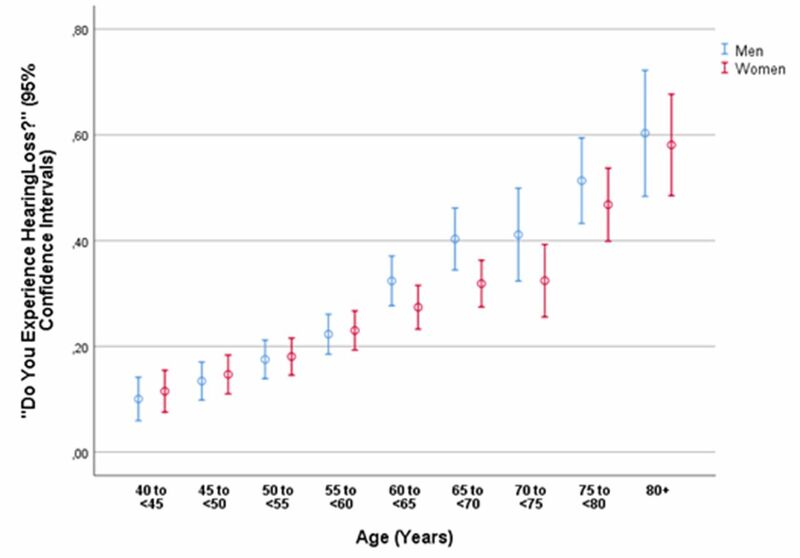 Graph showing the distribution of the hearing loss score stratified by age and gender in the Ural Eye and Medical Study. Hearing loss defined as a binary variable (question: ‘Do you experience a hearing loss?’) was prevalent in 1406 (26.1%, 95% CI 24.2 to 27.2) participants. It was significantly associated with a positive Weber’s test (OR: 24.0, 95% CI 15.7 to 36.7). The prevalence of hearing loss increased with older age (p<0.001; OR: 1.06, 95% CI 1.05 to 1.07) (table 3). In the age group between 60 and <80 years, the prevalence of hearing loss was significantly (p=0.003) higher in men than in women (38.93%, 95% CI 35.8 to 42.1, vs 32.8%, 95% CI 30.2 to 35.3). For the age group older than 60 years (p=0.57) and for the age group 80+ years (p=0.87), both genders did not differ significantly in the prevalence of hearing loss (figure 2). In the total study population, the prevalence of hearing loss increased from 10.9% (95% CI 8.0 to 13.7) in the age group 40 to <45 years, to 22.7% (95% CI 20.0 to 25.4) in the age group 55 to <60 years, and to 59.0% (95% CI 51.6 to 66.4) in the age group 80+ years (figure 2). 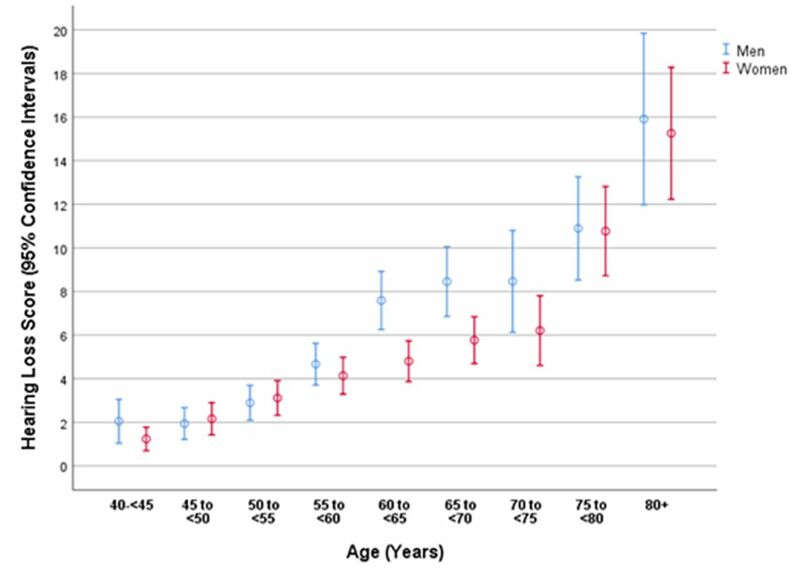 Graph showing the prevalence of self-reported hearing loss (defined by a definite answer of ‘Yes’ [in contrast to the answer of ‘Sometimes’ or ‘No’] to the question ‘Do you experience a hearing loss?’) stratified by age and gender in the Ural Eye and Medical Study. On multivariable binary regression analysis, higher prevalence of hearing loss was associated with older age (p<0.001), male gender (p<0.001), higher depression score (p<0.001), higher prevalence of headache (p=0.001), history of cancer (p=0.04), cardiovascular diseases including stroke (p=0.001), and osteoarthritis (p<0.001), higher amount of physically vigorous activity during work (p<0.001), and higher prevalence of alcohol consumption (p<0.001) and of dry eye feeling (p<0.001) (table 4). Prevalence of hearing loss was marginally correlated with a higher anxiety score, when added to the model (p=0.07; OR: 1.03, 95% CI 0.998 to 1.06). If diabetes (p=0.52), arterial hypertension (p=0.20), level of education (p=0.11; OR: 0.97, 95% CI 0.93 to 1.01), urban versus rural region of habitation (p=0.70), blood concentration of high-density lipoproteins (p=0.17) and low-density lipoproteins (p=0.52), current smoking (p=0.95) and smoking pack-years (p=0.37), best corrected visual acuity (p=0.93) and presenting visual acuity (p=0.62), and anxiety score (p=0.07; OR: 1.03, 95% CI 0.998 to 1.06) were added to the model, these variables were not significantly associated with hearing loss. In this Russian population, the prevalence of hearing loss increased from 10.9% in participants aged 40–45 years old to 59.0% in those aged 80+ years old. It was associated with older age, male gender, higher depression score, higher prevalence of headache, history of cardiovascular diseases including stroke, and osteoarthritis, physically vigorous activity during work, alcohol consumption, and dry eye feeling. It was marginally significantly correlated with higher anxiety score (p=0.07). In all the previous studies as in our investigation, the prevalence of hearing loss strongly increased with older age for both genders (figures 1 and 2).27 30–46 In our study population, the age-related increase in the prevalence of hearing loss was less marked for women than for men in the age group 60 to <80 years (figures 1 and 2). As in the previous studies on other ethnicities, the frequency of hearing loss was higher for men than for women.27 29–46 In our study, the gender difference holds true for the age group 60 to <80 years (38.93%, 95% CI 35.8 to 42.1, vs 32.8%, 95% CI 30.2 to 35.3; p=0.003). In the age group between 60 and <80 years, the prevalence of hearing loss was significantly (p=0.003) higher for men than for women (38.93%, 95% CI 35.8 to 42.1, vs 32.8%, 95% CI 30.2 to 35.3). For the age group younger than 60 years (p=0.57) and for the age group 80+ years (p=0.87), both genders did not differ significantly in the prevalence of hearing loss. In our study, a higher prevalence of hearing loss was associated with a higher prevalence of vigorous physical activity during work. It was in contrast to the finding reported by Gispen and coworkers,39 who used data from the National Health and Nutritional Examination Survey (2005–2006) and found that individuals with moderate or greater hearing impairment had greater odds than those with normal hearing of being in a lower category of physical activity. The association between vigorous physical activity at work and higher prevalence of hearing loss in our study might have been due to a potentially confounding correlation between heavy work and higher noise level at work. In the NHANES and in a study by Sommer et al,9 hearing impairment was more prevalent among adults with diabetes in a multivariable analysis. It is in contrast to our study where neither diabetes nor blood concentrations of glucose were significantly correlated with hearing loss (online supplementary table 1). As a corollary, the hearing loss in our study was not significantly correlated with body mass index (online supplementary table 1). It is in partial contrast to the results of the study by Lalwani and colleagues,37 who found that in children 12–19 years of age, obese adolescents as compared with adolescents with normal body weight had elevated pure-tone hearing thresholds and greater prevalence of unilateral low-frequency sensorineural hearing loss (p=0.01). A higher prevalence of self-reported hearing impairment was associated with a higher depression score in our study as well as in the study by Li and colleagues,38 who used data from the NHANES 2005–2010. They found that self-reported hearing impairment and audiometrically determined hearing loss were significantly associated with depression, particularly in women. The association between hearing loss and cardiovascular risk factors has remained unclear so far. While in our study population and in a study by Lohi et al 41 cardiovascular risk factors were not significantly associated with hearing loss, the NHANES and the Health, Aging and Body Composition Study reported that cardiovascular risk generated by smoking and diabetes was associated with both high-frequency and low-frequency hearing loss.26 29 30 35 Reasons for the discrepancy between the studies may have been differences in the study population (lifestyle in Russia vs lifestyle in the USA or in Korea), differences in the multivariable analysis and others. The limitations of our study should be discussed. First, the main outcome parameter was self-reported hearing loss assessed using a series of 11 standardised questions. In previous studies, audiometry was used to quantify hearing impairment. Although the latter method is a more quantitative one, the degree of self-reported hearing impairment as compared with audiometrically defined hearing loss may be more important to reflect the quality of the daily life of the individual. Interestingly, a study by Hannula et al 26 showed that self-reported hearing difficulties were more frequent than hearing impairment defined by audiometric measurement. Hannula et al 26 also reported that self-reported hearing difficulties predicted hearing impairment at high frequencies (4–8 kHz) rather than at frequencies of 0.5–4 kHz, which were commonly used to define the degree of hearing impairment in medical and legal issues. The test–retest reliability of the Hearing Handicap Inventory for Adults was evaluated in a study showing a correlation coefficient of r2=0.940.46 In another investigation, the HHIE-S showed a significant reduction in perceived emotional and social/situational effects of hearing impairment following the use of hearing aids.47 Second, although noise is a major determinant of hearing loss along with ageing, exposure to noise at the workplace was not specifically assessed in the study. This lack of data on noise exposure was therefore one of the limitations of the study. The amount of physical activity at the workplace, however, was evaluated, and in the multivariable model a higher hearing loss score was associated with a higher amount of physically vigorous activity during work (p=0.008) (table 2). Although the amount of physical activity at the workplace is not a direct measure of noise exposure, both parameters are correlated with each other so that a higher amount of physically vigorous activity during work may be a surrogate for an increased noise exposure. In conclusion, in our typically ethically mixed, urban and rural, Russian population aged 40+ years, the mean prevalence of hearing loss was 26.1% and increased from 10.9% in those aged 40–45 years old to 59.0% in those aged 80+ years old. In addition to older age, the prevalence of hearing loss was associated with male gender, depression, higher prevalence of headache, history of cardiovascular diseases including stroke, physically vigorous activity during work, alcohol consumption and dry eye feeling, and marginally significantly correlated with higher anxiety score. These data may be useful to assess the epidemiology of hearing loss in Russia and to assess factors associated with hearing impairment in Russia.
. Cigarette smoking and hearing loss: the epidemiology of hearing loss study. JAMA 1998;279:1715–9.
. The prevalence of hearing impairment by age and gender in a population-based study. Iran J Public Health 2017;46:1237–46. Wikipedia. Bashkortostan. https://en.wikipedia.org/wiki/Bashkortostan (Assessed 4 Mar 2018). Demographics of Russia. 2017 https://en.wikipedia.org/wiki/Demographics_of_Russia (Accessed 5 Nov 2017). WHO. Deafness and hearing loss. Fact sheet. 2018 http://www.who.int/mediacentre/factsheets/fs300/en/ (Accessed 18 Mar 2018).
. Diabetes and hearing impairment in the United States: audiometric evidence from the National Health and Nutrition Examination Survey, 1999 to 2004. Ann Intern Med 2008;149:1–10.
. Practical method for quantifying hearing aid benefit in older adults. J Am Acad Audiol 1991;2:70–5. Contributors Design and conception: MMB, RRF, GMK, JBJ. Data assessment: MMB, RRF, GMK, ZMR, IIA, TRG, VFS, NAN, SRM, DFY, RIK, AFZ, YVU, SKA, IFN, JBJ. Statistical analysis: JBJ, SP-J. Writing of the manuscript: JBJ, SP-J. Editing and final approval of the manuscript: MMB, RRF, GMK, ZMR, VFS, TRG, IIA, NAN, SP-J, SRM, DFY, RIK, SKA, IFN, AFZ, YVU, JBJ. Ethics approval The Ethics Committee of the Academic Council of the Ufa Eye Research Institute approved the study, and informed written consent was obtained from all participants. Data sharing statement There are no additional data to be shared.